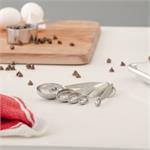 Stainless steel, multi-functional scoops used for melon balls, cookies, meatballs, potatoes, portion control, and more. Seven piece rigid plastic cutter set gives you fourteen combinations. One side of each cutter is fluted and one side is smooth. 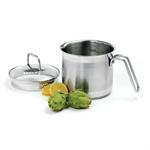 Use for cutting tarts, biscuits, pastry, scones, and cookies. Set includes; 1.5", 1.87", 2.25", 2.62", 3.06", 3.43" & 3.87". 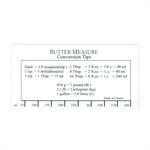 Every baker needs a Butter Measure! Lay this plastic card on top of your block of butter as a guide to cutting the precise amount of butter needed for your recipe, eliminating the need to use measuring cups or spoons. 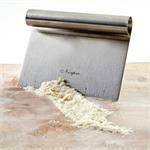 Chop ingredients, measure your dough and scrape your butcher block clean. You'll want to keep this stainless steel chopper/scraper handy for a quick measuring guide. 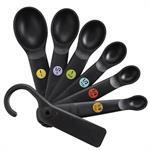 Six piece set with easy-to-read print on the handles and level rims for precise measuring. Sizes include 1/8 tsp, 1/4 tsp, 1/2 tsp, 1 tsp, 1/2 Tbsp, 1 Tbsp. Dishwasher safe with a hangtag ring. Switch from a flat tray to a convenient bowl in a snap. The tray side has a small lip around the edge that keeps smaller items from rolling off and larger bowls or trays are held securely by the non-slip silicone. Large, bright digital display. 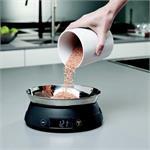 Multi Pots are ideal for measuring, mixing, cooking, serving and storing. This high-quality stainless-steel Multi Pot has a try-ply encapsulated base which makes it an ideal cooking pot and has a vented glass lid with straining hole. 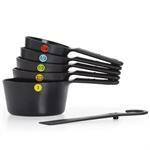 Multi Pots are ideal for measuring, mixing, cooking, serving and storing. Marked inside with measurements in both imperial and metric. 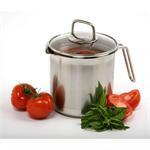 Ideal for vegetables, pasta, one-pot-meals, soup, boiling eggs, and much more. 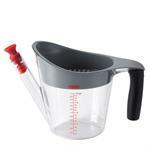 Perfect for use in the kitchen or on-the-go, you can measure, mix, pour, serve, store, and drink. The mixing disk efficiently mixes powdered drinks, marinades, flour and water for gravies, eggs for scrambling, and homemade salad dressings. Pour liquids with no-drip precision. Use these for all batters and liquids. 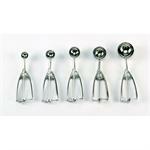 The long spout allows you to pour accurately into small containers or molds and to fill narrow-mouthed bottles. 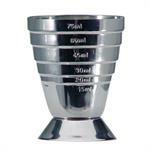 Constructed of sturdy stainless steel this jigger has multiple level lines to give you an accurate pouring guide for measuring any liquid. 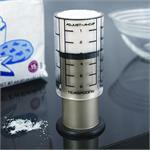 Embossed measurements in tablespoons, ounces, and milliliters won't wear off. Dishwasher safe. The OXO Good Grips 11 lb capacity scale allows you to pull the indicator display out so you can easily accommodate larger items. When you are finished the cord retracts neatly and the indicator display is held securely in place with magnets. 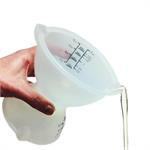 The ingenious cups eliminates the need to fill - lift - squint, add a little - oops, added too much... while measuring your liquids. By looking down as you pour (no more stooping) you can accurately measure the exact amount the first time. 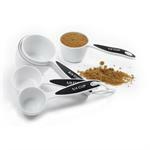 Take the guess work out of cookie sizes using the OXO Good Grips Cookie Scoops. You can quickly make every cookie uniform and in the size of your choice. With smooth gears and a soft grip handle, they are easy on your hands. 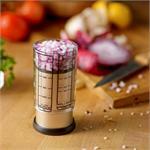 Easily separate the fat from your meat juices for superb gravies and soups. 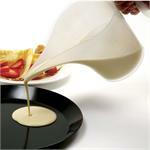 Pour your drippings into the container, the fat and grease floats leaving the pure juices to pour out the bottom. 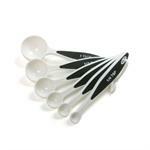 The OXO Good Grips 7 piece Measuring Spoon Set features raised measurement markings that will not wear off & are colour coded to be easy to read. 1/8 tsp. (0.6 ml), 1/4 tsp. (1.25 ml), 1/2 tsp. (2.5 ml), 1 tsp. (5 ml), 1/2 Tbsp. (7.5 ml), 1 Tbsp. (15 ml). 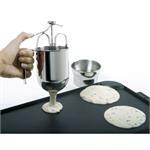 Stainless steel dispensers easily and accurately dispenses batter directly onto griddle or into baking pans. Stands upright in base on counter. 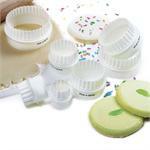 Multi-purpose dispenser for pancakes, waffles, crepes, muffins, cupcakes. No wasted batter or mess. Pop it up to use and collapse to store, saving you valuable space in your cupboard, RV, or camper. Measurements are clearly marked on the inside of the cups and are flexible for precise pouring and the wide bases provide stability. 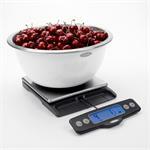 Just what you need for ease and accuracy of measuring. 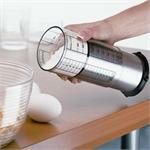 Pro 1 cup Adjust-A-Cup® measures dry ingredients and solids in both cups and milliliters. 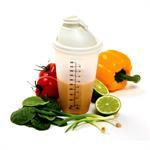 Liquid ingredients are measurable in pints, cups, ounces and milliliters. Leak-proof plunger can quickly be set at desired quantity line, and the cup can be filled to the top and leveled off. Solids and semi-solids such as shortening, peanut butter, honey and molasses slide out mess-free with the push of the plunger. The leak-proof plunger can quickly be set at desired quantity line, and the cup can be filled to the top and leveled off. Solids and semi-solids such as shortening, peanut butter, honey and molasses slide out mess-free with the push of the plunger. 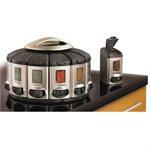 12 spice containers on a rotating base can be mounted under the cabinet or stacked on the counter. You can pour or shake from the top. A pre-measured 1/4 teaspoon of spice is dispensed from the bottom with each click of the front dial. 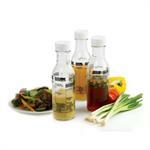 Mix and drizzle your salad dressings with this 11oz. glass bottle. 6 Easy to follow recipes on the side of the bottle. 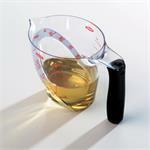 These high quality silicone measuring cups are flexible and squeezable for precise pouring, allowing you to pour through small openings, to drizzle, or for portion control. 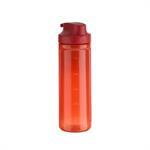 The flat, stable base keeps the cups upright and steady. 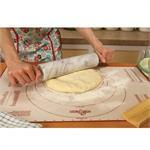 No more guessing when the recipe tells you to roll dough to a certain round or rectangular size. Measurements are in imperial and metric, eight printed diameter sizes. 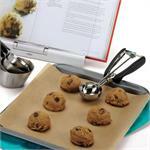 Charts include volume, weight, oven temperatures, and dimension conversions as well.